Virtual Reality headsets are becoming an increasingly popular tool in the architect or designer’s arsenal. Equipped with a stereoscopic head-mounted display, stereo sound, and head motion tracking sensors, VR headsets are especially useful for helping people who lack the expertise to interpret architectural diagrams. 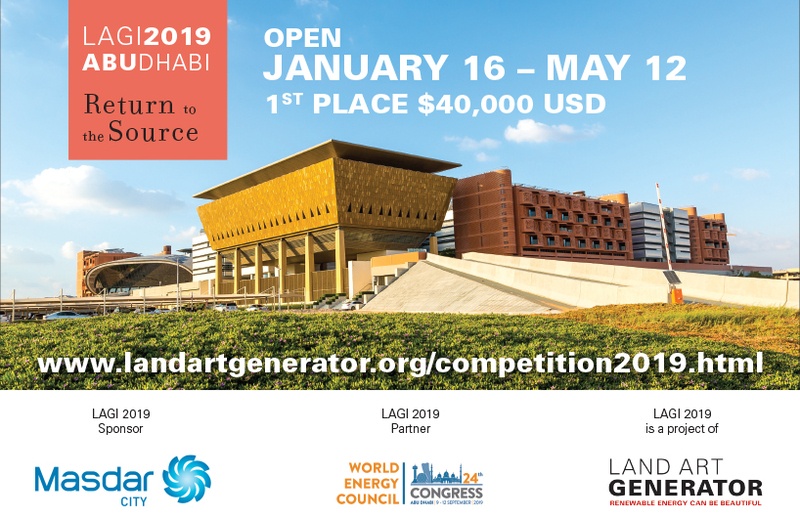 And — it turns out — for bringing Land Art Generator submissions to life. 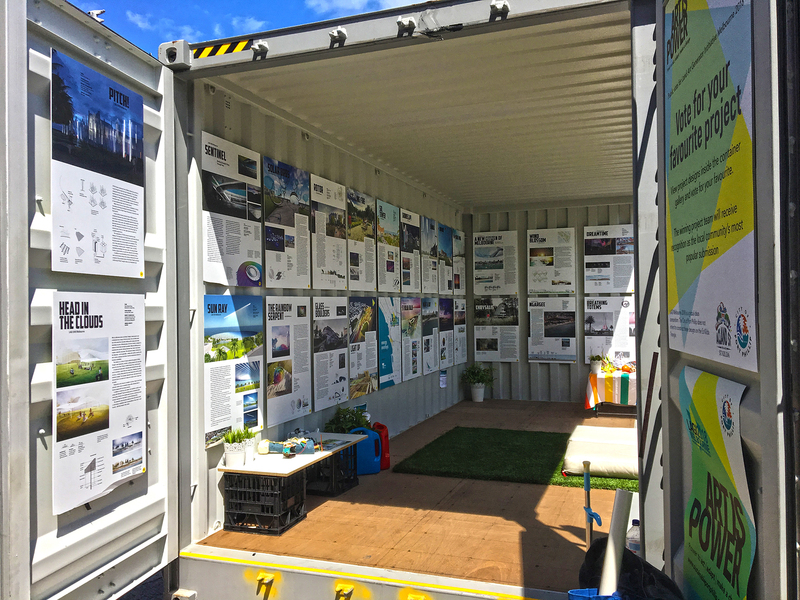 In October, during a week of outreach programming following the winning announcement of the 2018 Land Art Generator design competition for Melbourne, the St Kilda community had the opportunity to meet a few of the 25 shortlisted design teams. 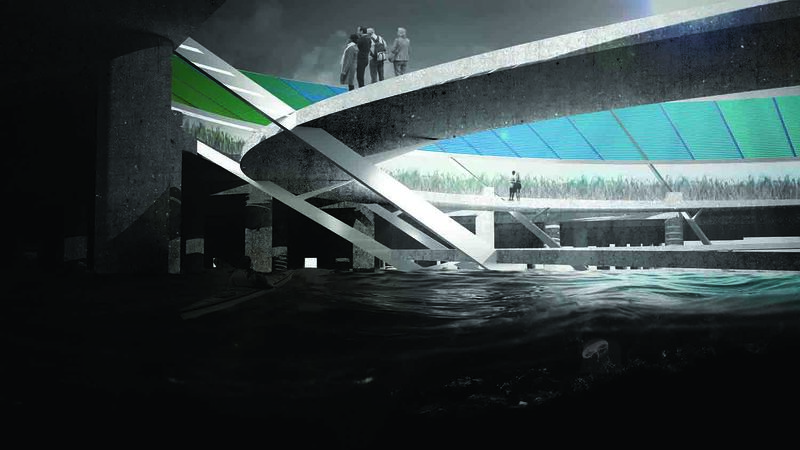 They also had the chance to vote for their favorite LAGI 2018 project and explore other shortlisted designs at a popup exhibition at Acland Plaza. 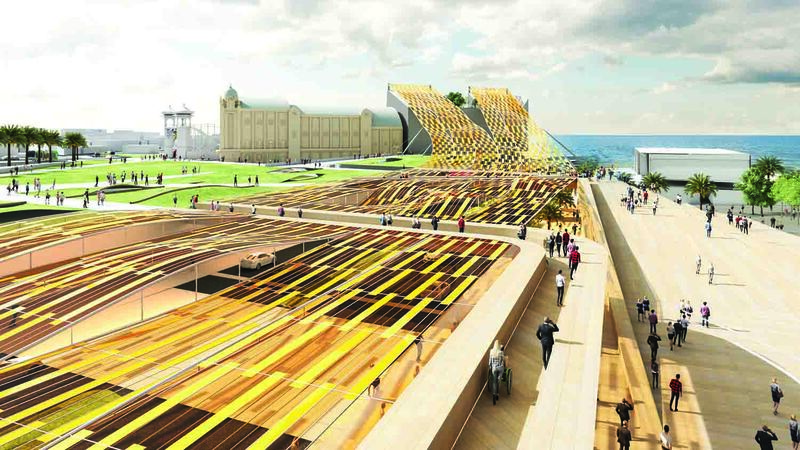 In so doing, they received an in-depth look at how an energy-generating work of art would benefit both St Kilda Triangle and the greater City of Port Phillip. 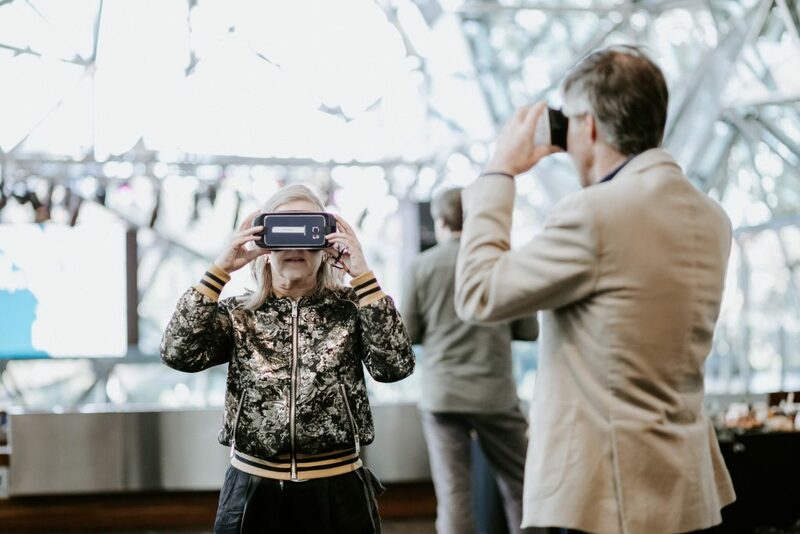 Yet architect Pete Spence from Grimshaw Architects, the design firm that took second place in the people’s choice vote for St Kilda Halo, says they sought to make the experience even more engaging by incorporating VR into their presentation. “It is quite a complex project and that’s difficult for lots of people to really visualize or understand,” he says. “But they had some success with the virtual reality, which helped them better connect with the scheme”. Spence says Grimshaw Architects feels morally obliged to engage with the broader community in this way, to help generate and contribute to informed conversations about the importance of good, responsible design. And for their part, he adds, visitors seemed excited by the possibilities. As visitors engaged with the VR, Spence and others from the Grimshaw team explained how the undulating steel frame covered in triangular Sphelar modules will produce 2,000 MWh of solar energy annually, enough to power 400 Australian homes. 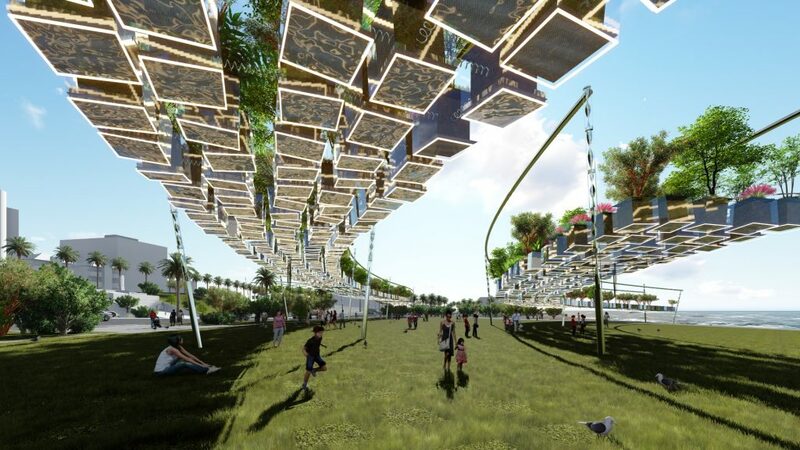 Mirroring the form of nearby Luna Park’s Scenic Railway rollercoaster, their design was inspired by the way a forest captures dappled sunlight through the canopy, and the VR shows how it would complement the existing St Kilda Triangle site. 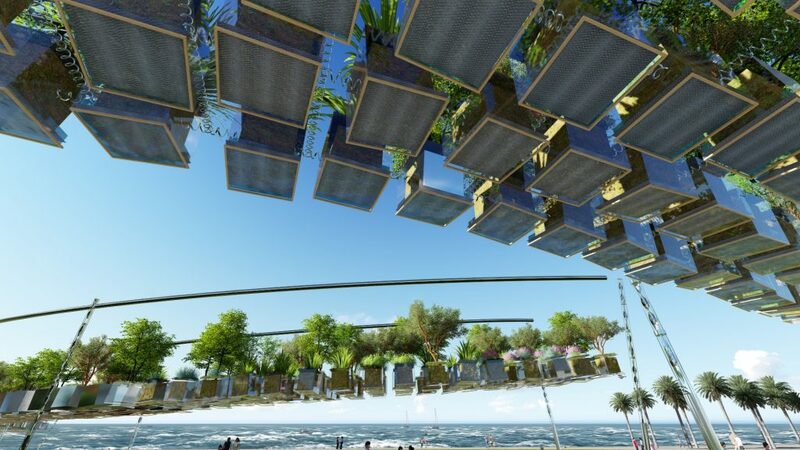 The 2000 Murnongs team also used VR to help illustrate their design, which is comprised of 2,000 elevated planter boxes showcasing the indigenous Murnong plant that they say has nearly been rendered extinct due to invasive species and various land practices. Together the boxes sway in the wind to generate 150 MWh of clean energy annually. Qidi Li says at ASPECT Studios, where he and the rest of the team work, they are always eager to experiment with new technology to engage with various stakeholders and that VR is very easy to understand. He adds that it pushes them in-house as well, though it doesn’t require a lot of additional work since they already create 3D models for all of their projects. 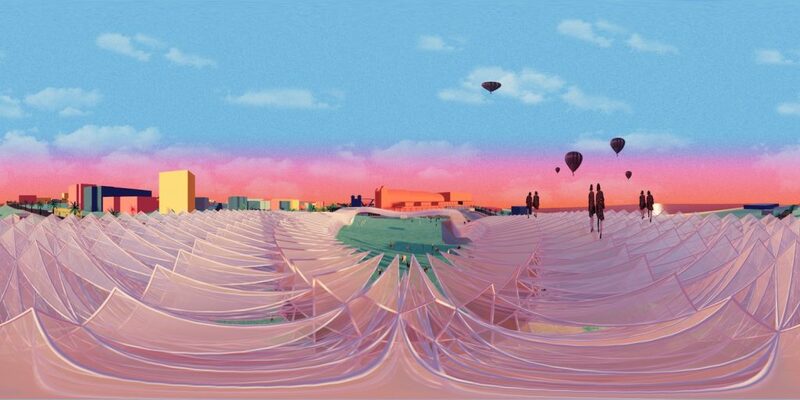 In addition to sharing their goggles with members of the community, Li says they had the chance to meet a council member — who would potentially be among the group of people in a position to advance construction of the first Land Art Generator design in St Kilda Triangle. Elizabeth and Monoian, LAGI co-founders, say that virtual reality and augmented reality are both excellent tool to engage the general public with new ways of understanding the multifaceted benefits of renewable energy infrastructure—that it doesn’t need to be just flat blue solar modules and three-blade wind turbines. Guests at the 2018 LAGI Awards Event took a virtual walk-through of Grimshaw Architect’s St Kilda Halo, one of the shortlisted entries to LAGI 2018 Melbourne. Grimshaw and ASPECT aren’t the only designers using VR technology. World renowned architects HOK say they have been using VR since around 2014, though the technology really exploded in 2016. 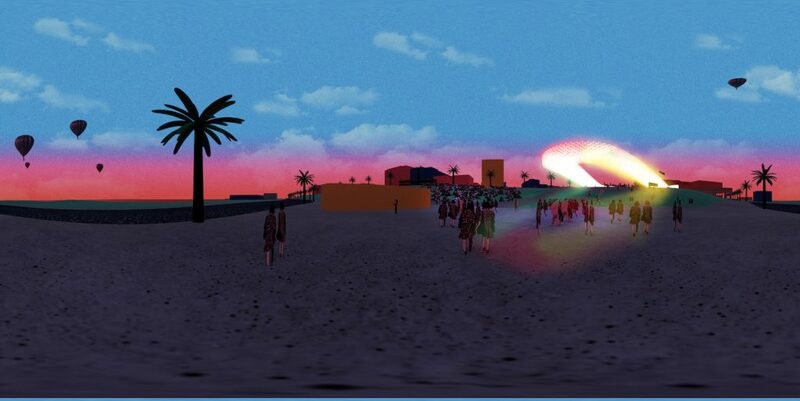 Now they use VR to aid clients’ understanding of a variety of small and large-scale projects and typologies, including interior design, sports arenas, aviation and healthcare. Monoian and Ferry say the possibilities are endless, though they’re even more excited to see LAGI designs that we can walk through and experience without the headset. Follow this link to a 360-degree look at 2000 Murnongs elevated over St Kilda Triangle. 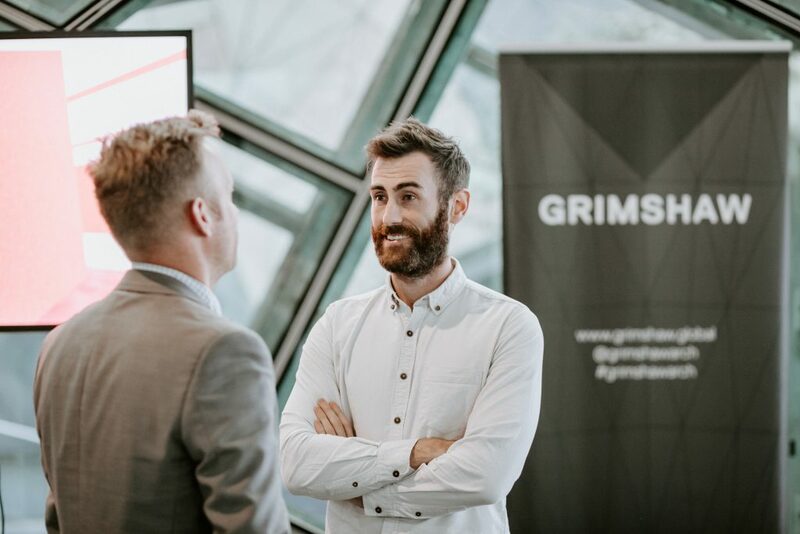 Pete Spence with Grimshaw talks with an attendee of the 2018 LAGI Awards Event on October 11, 2018. Guests that evening took a virtual walk-through of Grimshaw Architect’s St Kilda Halo, one of the shortlisted entries to LAGI 2018 Melbourne.